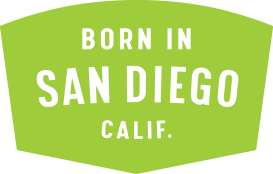 San Diego Brewery Jobs | Green Flash Brewing Co. Careers – Green Flash Brewing Co. Craft beer is our passion. It is part of who we are. Inspired by fresh ideas and a longing for adventure, we are devoted to experimenting with unconventional ingredients and creating radical beer styles. We are perfectionists, obsessing over every detail of the brewing process, because we believe each Green Flash beer should be as remarkable as the last. We are evangelists, sharing our love of craft with everyone we meet. We pour our heart and soul into every beer we make because of our passion for craft. Because of who we are. Because we are Green Flash. We are looking for hard-working, passionate, talented individuals to join our crew. See below for a list of open positions and select to learn more. JOB SUMMARY: Responsible for planning and implementing strategies to drive sales to reach annual determined sales goals – specifically within chain on-premise and venue accounts. Manage assigned national chains, local and regional chain accounts. Work with Director of NA/ VP of Sales to establish partners for national distribution. Establish and manage the sales department through communication on execution, distribution commitments that are required for any and all chain business. Work to establish sales and distribution goals and support in all territories. Develop the Strategic Sales Plan to increase sales at the local, regional and national level within chain on-premise and venue accounts. frequently required to use fine manipulation and simple grasping in order to handle production equipment and to utilize the computer and other standard office equipment such as telephone, fax machines, copiers, etc. frequently required to lift and transport items weighing up to 25 lbs. Equipment typically used: Computers, brewery production equipment. Employee frequently works in a brewery environment with a moderate amount of noise and activity. The work environment is fast-paced and demanding. JOB SUMMARY: Responsible for increasing sales within regional territory and executing and managing distributors’ annual business plan (ABP). Manage inventory at the distributor level and perform quality control verification. Train distributor and retail personnel. Must be located in Denver, CO area. Frequently required to lift and transport items weighing up to 50 lbs. The work environment is fast-paced and demanding. JOB SUMMARY: Responsible for increasing sales within regional territory and executing and managing distributors’ annual business plan (ABP). Manage inventory at the distributor level and perform quality control verification. Train distributor and retail personnel. Territory will cover North LA, Central Coast up to the Fresno market. Candidate needs to be located in Sylmar or Venture area. JOB SUMMARY: Responsible for increasing sales within regional territory and executing and managing distributors’ annual business plan (ABP). Manage inventory at the distributor level and perform quality control verification. Train distributor and retail personnel. Must reside in Sacramento. JOB SUMMARY: To efficiently complete all tasks and ensure 100% guest satisfaction. Prepare a variety of meats, seafood, poultry, vegetables and other food items for cooking in broilers, grills, fryers, smokers and a variety of other kitchen equipment. Assume 100% responsibility for quality of products served. Know and comply consistently with standard portion sizes, cooking methods, quality standards and kitchen rules, policies and procedures. Stock and maintain sufficient levels of food products at line stations to assure smooth service period. Portion food products prior to cooking according to standard portion size and recipe specifications. Maintain a clean and sanitary work station area including tables, shelves and all cooking equipment. Prepares item for broling grilling, frying, sautéing or other cooking methods by portioning, battering, breading, seasoning and or marinating. Follows proper plate presentation and garnish set up. Assists in food prep assignments during off peak periods as needed. Attends all scheduled employee meetings and brings suggestions for improvements. Constantly required to use various kitchen equipment including but not limited to: Broilers, grills, fryers, smokers. Constantly required to use fine manipulation and simple grasping in order to handle bar equipment, glassware, bottles, keg taps, etc. Occasionally required to lift and transport items weighing more than 100 lbs. Variety of kitchen equipment, computers. JOB SUMMARY: Under the work direction of the Brewers, the Cellerman I is primarily responsible for cleaning and filling all kegs of beer that are produced at The Green Flash Brewery. Equipment typically used: Keg washer, keg fill rig with a portable pump, pallet jack and forklift. 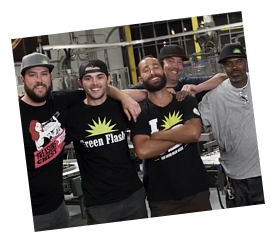 JOB SUMMARY: Under the work direction of the Packaging Supervisor, the Packaging Operator is primarily responsible for running the packing line for beers that are produced at The Green Flash Brewery. Maintain packaging records. Use Plex as primary method. Equipment typically used: KHS filler, bottle labeler, Standard Knapp case packer, Top Tier palletizer, pallet jack and forklift. JOB SUMMARY: Brewer 1 is primarily responsible for brewhouse operation. Brewer 1 is responsible for overseeing cellar operations and accurate, complete record keeping. The Brewer 1 will also perform centrifuge and filter operation, cellaring, fermentation monitoring, yeast handling, dryhopping, finishing and clarification. Brewer 1 will train Assistant Brewer 1 and 2 in cellar functions. Hold a brief daily shift meeting with Assistant Brewer and Cellarmen to prioritize shift tasks and assign duties. This meeting will serve as a transition and communication between shifts. Maintain orderly inventory of malt, hops and other brewing supplies as needed. Completed training/education at an accredited brewing institute or 1 year equivalent experience in a Cellarman position in a comparable production brewery. Must be able to read/comprehend written and oral instructions in English; read and comprehend safety rules, operating and maintenance instructions, procedure manuals and product recipes/material identifications. General computer and data entry skills in MS Word and Excel preferred. frequently required to lift and transport items weighing up to 170 lbs. JOB SUMMARY: Under the work direction of the Brewers, the Assistant Brewer 2 is responsible for cellaring, fermentation, yeast handling, dryhopping, finishing and clarification. The Assistant Brewer 2 will assist the Brewers on shift in the brewing processes as directed. Responsible for increasing sales within regional territory and executing and managing distributors’ annual business plan (ABP). Manage inventory at the distributor level and perform quality control verification. Train distributor and retail personnel. This person would be located in the San Jose area. Qualified candidates should send resume, cover letter and salary history to [hideemail email=”jobs@greenflashbrew.com”] Please indicate the position you are applying for and your name in the subject line.